Ann M. Streetman may have inherited her interest in storytelling from her father who could spin a good tale. 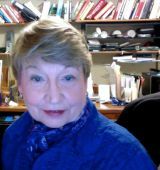 Then came her degree in journalism and a lifelong career in many kinds of communication.She served more than 14 years in various management positions (including president and chief paid staff) of Texas Safety Association, which was a not-for-profit statewide educational organization. Before and after association management, she enjoyed freelance manuscript book editing (21 books). Along the way, she also served for 9 years as media contractor for Region 6 National Highway Traffic Safety Administration (5 states and the Indian Nations via the Bureau of Indian Affairs Indian Highway Safety Program). Her duties there included writing many news releases, news conference notifications, public service announcements, and educational materials for Region 6 entities and their partners. Now she enjoys writing e-books for adults and children.